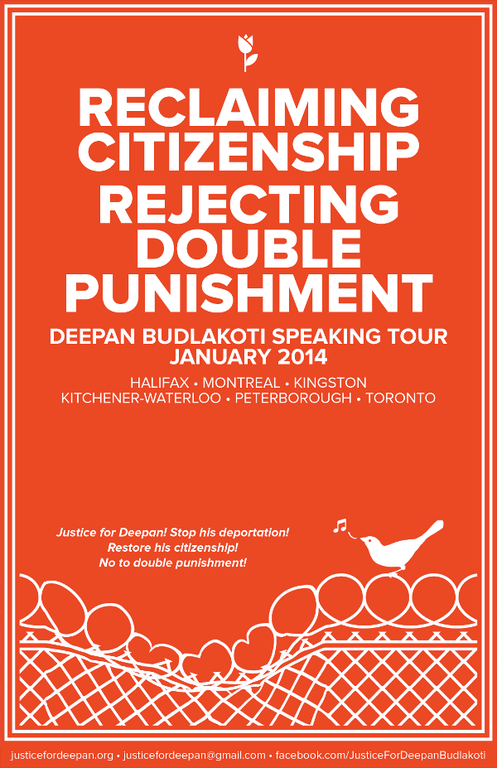 January 20th, 2014 -- On January 16th 2014 Deepan Budlokati spoke at the Downtown Community Centre in Kitchener, Ontario as part of a speaking tour to raise awareness of the shocking situation the Harper government has put the Canadian born man in. On today's show co-hosts Dan Kellar and Rachel Avery speak with Deepan in the CKMS studio in Waterloo. Deepan is subject to unfair double punishment t for a crime he has already served prison time for. Now the government has stripped Deepan of his citizenship and are trying to deport him to his parents homeland of India, a state he does not hold citizenship to nor a place he has ever lived - both his parents are Canadian citizens. Deepan is fighting to get his citizenship back and to defeat what would be a precedent setting move by the Harper government - taking away citizenship from a naturally born Canadian, to deport him to a country that will not receive give him status. A charter challenge has been raised as has A UN motion that would push Canada's accountability to its international agreements (not making a person stateless). Deepan speaks to us about his case, about the conditions for those caught up in the immigration and refugee prison system, the systemic abuse coming from guards in that system, and the complete lack of due process given to folks entrapped. We also speak about the ongoing #migrantStrike andthe isoloation detainees face in prison. Deepan points to several ways the Harper government has made the immigration and refugee system worse since tehy came to power in 2007. Deepan reminds people to always fight back and notes that folks can check out justicefordeepan.org and @justice4deepan for more info about his case and how you can support him. music from Lowkey with Dear England (ft. Mai Kahil) and Bandista with Haymatlos!